Friday June 22, 2007 the Gypsy Pie Society (GPS) gathered on Ludington and 8th street at the 8th Street CoffeeHouse in Escanaba to share poetry and photography. Arriving early, I took some dinner down to the waterfront and discovered Ludington Park. Off work at 3pm, I made the trip early, stopping along the way to gather items for the camping trip this weekend. I had a migraine by the time I stopped for dinner. Regardless I walked in the wind and sun and drank in the park, marina, kids and dogs, people putting together thier pontoon boat, seagulls, wild roses. I got to the coffeeshop 30 minutes early and decided there was not a single poem I wanted to read. So I enjoyed the company, Tamara, Ann, Mark, Becky, Micheal all had things to share. It had been two months since we gathered in Munising. Personally, with commitments, I had stuggled to create new poetry. But I suceeded in finishing the website and starting this blog. I picked up freelance work doing webdesign. I went on a trip to the west end of the peninsula: Paulding Lights, Bond Falls, Sylvania Wilderness, Black River Gorge, Antonios. Once I shifted to the floor, tossed off my sandals, removed my jewlery, and lounged I was able to ease the headache some and enjoy the company I was in. Mark is an amzing photographer. Ann had wonderful black and whites that she will be printing on copper. Mike is working on his next poem, from the mother’s point of view–Fall. Tamara is working on a Gypsy inspired poem. I shared my signature poem on request. And work I hope to approach this weekend while camping. Our next GPS gathering will be in Houghton August 30th. I am posting this unedited as I leave for Big Bay and a campsite near the shore of lake Independance. They called it the strongest storm front to move though the Marquette, Michgian area in years. I was so awestruck I did not pick-up my cellphone to take shots. I did not grab my digital camera. 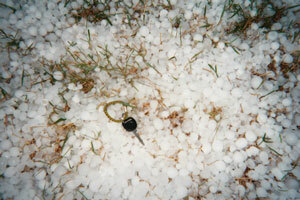 The hail came down so hard it was a white-out. Water rushed down Baraga Avenue in front of the Marquette Food Co-op where I was doing my Particating Owner Shift. The water fast and deep was at least a foot deep if not more. Hail the size of golfballs. I watched the face of farmers and friends and I wanted to cry. I rushed home as soon as the storm passed. Windows open. 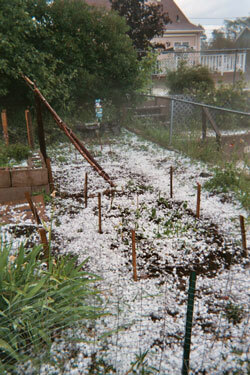 My garden shredded by hail. A Hosta plant four feet in circumference mere shreds. The Tomatoes plants a single stalk. Bark had been stripped from tender cherry trees. The hot peppers beaten to small pieces, now laying on the ground. Neighbors had damage to thier Japanese model cars. My Grand Am made of harder steel okay. The fascia and siding on neighbors houses damage. Windows broken. Screens torn. Roof shingles peeling. The streets lined with green leaves looked surreal. My daughter called to make sure I had not been caught ouside in the storm. I called Mike who came home from work. We called family to see how they had faired. Mike took some digital photos and I will post some soon. Still, today I am in awe of the damage to the gardens. Parking at Wetmore landing, I am greeted by the cool of the woodland and blooming thimbleberry plants. I know my destination, the rocks of the lakeshore big granite bemoths smoothed by time, waves, and sand. This year the water levels are low and I can manage walking out to a new sitting spot with only cuffing my jeans. I balance two journals, my sandals, a small white bag from Third Street Bagel, and a 160z coffee. It is 9am, water calm as glass, 70 degrees and slightly humid. The sun glares of the water and a haze is on the horizon. I want to skinny dip but I hear the voices of men on the wooded trail that circles this landing. Stretching in the sun, my back adjusts to the curve of the stone. My eyelids, closed, reflect shimmering waves of light the same as the glistening water. Songbirds sing a morning song in the nearby woods. I can hear work at the power plant and a few cars passing on the highway. Water laps granite and I decide to brave the waters. I slip from my jeans and slide down the salt and pepper granite to where the green seaweed forms a slimy coat to the rock. I am up to my waist before the full alarm of my body registers that Lake Superior is still hypothermic cold. I scramble for an easy way up onto solid rock. Needles. Pain. I cannot find a handhold to boost myself from the waters and I have to expose myself to the shore in order to climb up. No one is around so I let the heat of the rock and sun dry my body before slipping into my blue jeans again. A butterfly flits up to my face and beats his wings against my neck and shoulder. I feel shiny and electric. This place urges me to let loose and I am happy to listen to my senses. I walk out pink and red granite standing as far out int the great lake as I can for Tai Chi and Qigong practice. Cloud Hands. Parting the Clouds. Silk Reeling. I have soft gaze not focused but aware. A family is on the shore enjoying the beach. Golden Retriever. A mom and dad, small boy of not yet two. Returning to my journals everything is vivid. Fluorescent green pollen left behind by higher waves has left new temporary coloring on this pink granite. Under the water, crevices of rock look deep red. I kneel and notice grains of clear quartz the size of rock salt granules. Back on the woodland path under towering oak and red pine I return to my car. A spider’s web sticky silk clings to my face and hair. Gravel under my bare feet is uncomfortable but I do not stop to put on sandals. A mosquito buzzes my ear and I think what distraction am I to these insects? Sitting at the coffee house, I find myself jealous of throw pillows. In the wide sunny window, red-heart suckers hang by ribbons and I realize like this dressed-up sofa I’ve been window dressing, trying on the dreams of others. Wearing silk and taffeta listening to my rustlings as I skirt responsibility. When will I be happy with writer and poet? In the late afternoon, my office tucked under the roof becomes too hot. Web design becomes tedious when I am hot so I called my daughter and asked her if she would like to replant her palm. When Ceiri moved out “Palm” baked for a while in the tiny closed room–just off the too hot office. I brought Palm downstairs weeks ago and began misting with a tiny spray bottle trying to nurse him back to health. One-by-one, I cut off a frond until there were only three left. And I wasn’t sure if he’d be better off with them all axed. Ceiri has been busy readying the nursery for Liam Thomas Connors. Her first son. My first Grand Boy.Palm waited patiently. And today we both made time for Him. New pot. New Soil. A graying grandma to be and a young pregnant woman, together, repotted, watered, and misted. We gossiped and caught up on family news. A short hot afternoon was too soon over. I drove my daughter and Palm home. Watched Liam kick. And listened to my daughter explain how hard it is getting to breathe.